October 5, 2018 – The Independent Commission of Investigations (INDECOM) became the first Caribbean and Non-American recipient of NACOLE’s (National Association for Civilian Oversight of Law Enforcement) Achievement in Oversight Award. 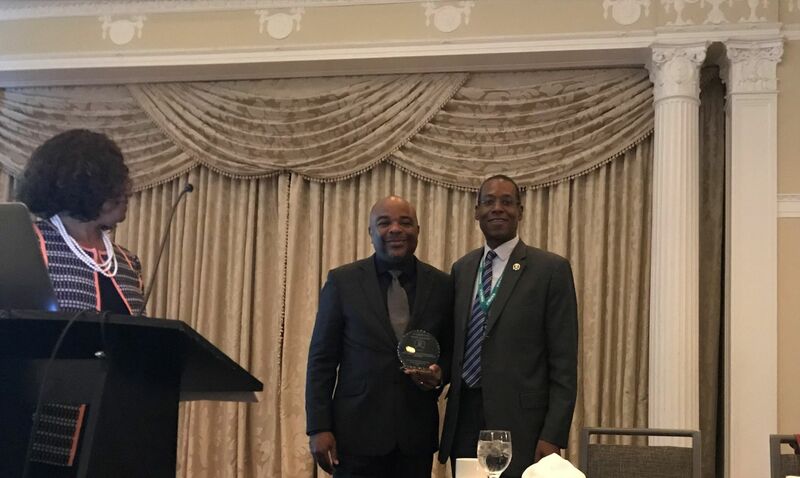 The award was presented at the 24th Annual NACOLE Conference Sankofa Dinner and Awards Ceremony held on Wednesday, October 3 in St. Petersburg, Florida. In accepting the award, INDECOM Commissioner, Terrence Williams, expressed his gratitude and noted that he accepted it on behalf of his staff, members of the Security Forces for which the Commission has oversight and all Jamaican citizens. He recognized the dedication of the Commission even during challenging circumstances. “I am really very proud of the work done by these Investigators and the staff of INDECOM,” said Commissioner Williams. Williams further commented on the positive change happening within the police force, army and correctional services, in improving their standards and giving more recognition to the rights of citizens. In furtherance of the Commission’s resolute approach to independent investigations, Commissioner Williams affirmed that the Commission will strive to ensure that there is rule of law, fairness and accountability. The Achievement in Oversight award recognizes specific, significant accomplishments or contributions to civilian oversight by individuals, an organization, or an agency, which have helped to further the field of civilian oversight of law enforcement. The Commission has been a member of NACOLE since 2015, and three members of the organization’s senior management, to include the Assistant Commissioner and two Directors of Complaints have completed the NACOLE Certified Practitioner of Oversight Program. NACOLE is a non-profit organization, established in 1995, that brings together individuals and agencies working to establish or improve oversight of police officers. NACOLE has worked to legitimize police oversight as a professional field of study and practice and has facilitated the development of professional standards. NACOLE began to formally recognize contributions to civilian oversight in 2001.